In Model Cars > Hot Wheels > Show & Tell. 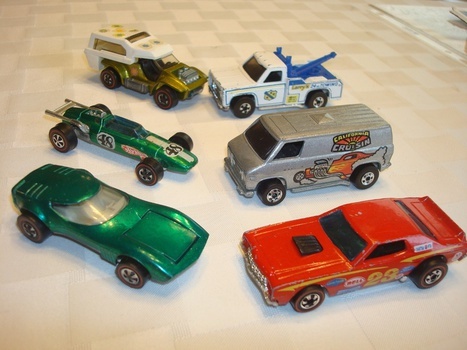 A few of my samples of high quality original redline Hot Wheels. The Ramblin Wrecker and California Cruisin Van are do not have redline wheels, but are from the same era (both are 1974-1975 releases). The first group includes: Power Pad, Ramblin Wrecker (Larry's 24 Hr Towing), Indy Eagle, California Cruisin Van, Torero and Ford Torino. 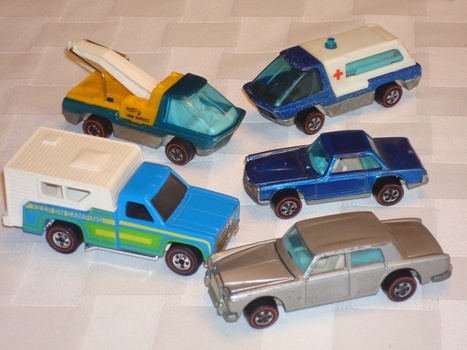 The second group includes: Heavyweight Tow Truck, Heavyweight Ambulance, Backwoods Bomb, Mercedes 280 SL, and Rolls Royce Silver Shadow. How do they look?! Really love the Heavyweights! They are some of my favorites for the Redlines. They look really nice! If you have more , please post them. I did not know that, but that is interesting. I can imagine Mattel accidentally putting Larry Woods' actual phone number on the truck.. probably originally as a placeholder on the prototype that slipped through to production or something like that. THANK YOU Boxlunchkiller, Stonesfan1, officialfuel, and kerry10456! Thank you for the love pops52! Thanks for the love Mike and jono!